Built 1899-1900 as "Neues Stadttheater" by Alexander Graf. Opened 29 July 1900 with Franz von Schönthan and Gustav Kadelburg's "Zwei glückliche Tage". 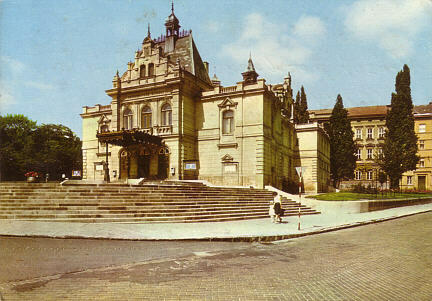 Later renamed "Jihomoravské divadlo" [South Moravian Theatre]. Current name: "Mestské Divadlo" [Municipal Theatre]. 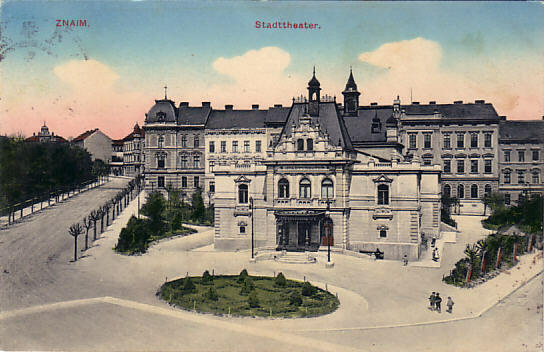 Front Text: "Znaim - Stadttheater"
Reverse Text: "Znojmo, Jihomoravské divadlo"